Pineapple Casserole - sounds weird, but this is THE BEST! Everyone raved about this easy casserole. Only 6 ingredients - pineapple chunks, flour, sugar, cheddar cheese, Ritz crackers, butter. SO easy and SO delicious! Great for potlucks! Everyone always asks for the recipe. Last fall we went to Amelia Island, FL for vacation. We love Amelia Island. It is off the Florida coast about an hour from Jacksonville. It is super relaxing!!! We love walking on the beach, golfing, going to the spa and eating at all of our beach favorites. One of my absolute favorite places in Amelia Island is a place called Sliders. It is nothing fancy, but they have live music and you sit on the beach when you eat outside. PLUS the food is surprisingly good! On our last visit, we tried a new side dish with our meal - Pineapple Casserole. We had never heard of such a thing, much less eaten it. OMG! It is SO good! I knew I had to recreate the dish when we got home. I finally got around to making my own version and it was even better than the original. Pineapple chunks topped with flour, sugar, cheese and Ritz crackers. I know it sounds super strange, but I promise you will like it. Chicken Legs took one bite and loved it. He is still talking about how good the Pineapple Casserole was! We are definitely making this for Easter this weekend. Give it a try. I promise you won't be disappointed. Drain the pineapple, reserving 1/2 cup of the juice. Place drained pineapple chunks in bottom of prepared dish. Combine flour and sugar and sprinkle over pineapple. Drizzle with reserved pineapple juice. Sprinkle the cheese over the pineapple. Top with cracker crumbs. Drizzle casserole with butter. Bake for 35 to 45 minutes, until bubbly and golden brown. The Pineapple Casserole does sound strange, but that recipe has been around for 15-20 years. Maybe it is a regional thing, but always gobbled up at potlucks, etc. Some recipes call for pineapple tidbits, but the chunks are the best. 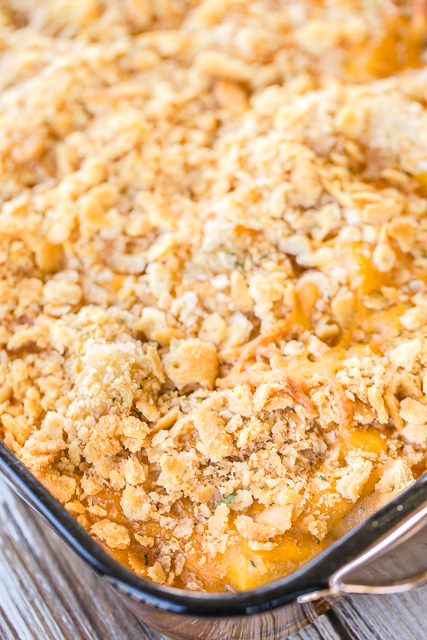 This is my go-to casserole for potlucks! Try tossing the cheese, flour and sugar with the chunks before topping with the crushed crackers. It gets the cheese and sugar mixed in with the pineapple. Great served with ham. How on earth have you been in the recipe/food business in the south and not know about pineapple casserole??? You have missed a lot of good eating. You are right that it is great. I am glad you found it, and have included it for others that might also be in need of a delicious treat. Side dish or dessert, it is a winner. 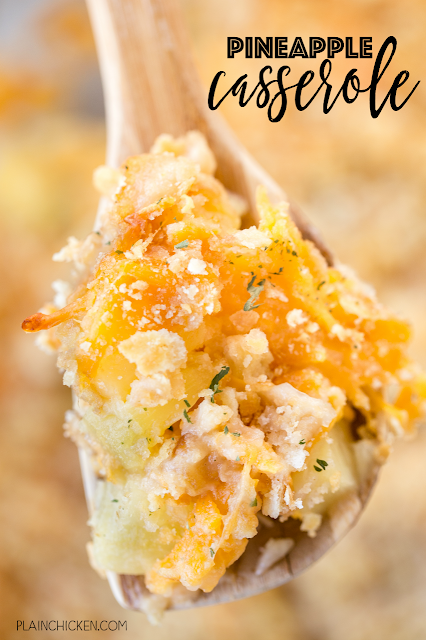 Thinking that this was a potato casserole at our church function, I tried it and loved it. Had never had it or heard of it and honestly probably would not have tried it if I had known what it was but so glad I tried it by mistake. lol Thanks for the recipe. I haven't frozen this, but I don't see why it wouldn't work. Enjoy! DO YOU SERVE IT HOT OR COLD??? WE ALWAYS SERVE IT HOT!!!! Is this a dessert or a side dish?